smart have not been train by his parents at all, why would he abuse people who has right to burry his parents upside down? God shows to you that no man has the final say. Stop trusting and worshiping Pastors but God. God decided to do it the He does in order to stop some of you from going round PRAYER HOUSES seeking for "THUS SAYS THE LORD" from Men. Give your life to Christ, live a faithful life, study your scripture and pray, God will and can surely speak to you whatever He want you to know. You were not to meant to know everything. Stop worshiping MEN in the name of GOD. Whatever prophesy you are hearing or expecting to hear, bear in mind that JESUS CHRIST is coming and can come anyday; niether BUHARRI or JONATHAN cannot stop the coming of Christ and HIS judgement. In all i am saying that let us not only judges two persons' right or wrong in a country where we have millions of corrupt, stingy and selfish people including you who is judging these two human being today. Ask yourself how possible is it for two good persons to control millions of corrupt persons. If Jonathan or Buharri create an employment now, will you allow the employment to get to the less priviledge? 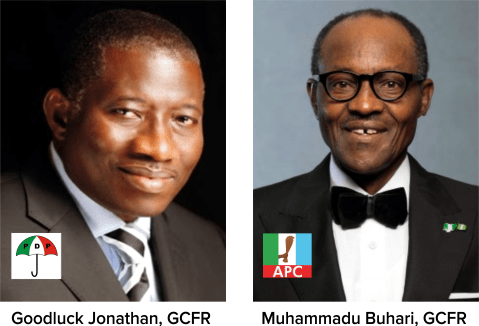 If salary should be increase now by these two persons, will you and your god fathers allow it to be release on time without taking it to the bank for FIX DEPOSIT in order to make your gain first before you think of the fault you should bring on the innocent staff in order to still deduct the money. In your own capacity, what have you done to help Nigeria to move forward? All our Governors that opening companies for themselves in our State and divert all contracts to themselves and leave given out to others, is it done by Jonathan or Buharri? What can we say about POWER, we make use of Generators everyday but end up paying bills to PHCN who releases their boys to disconnect light from your premises, which one of those boys may be you who is trowing words and abuse to Jonathan and Buharri even when you know that your oga has not provide electricity to the mases, yet you will be happy and bold to cut people light. Friends, for Nigeria to change for good, you and I must experience a change in us for something to change around us. Also judge and prophesy to yourself and your clique. In three(3) days time change will take place in our country Nigeria not power against the citizens. To me Goodluck Ebele Jonathan is not competent enough in ruling this great country. No jobs, Innocent people died, Some people are suffering and you are thinking of going for another round. It is not possible APC all the way Say BABA, Say Buhari. We need Change in our leadership. so many Nigerians are very stupid to an extend dat they are being conviced by d tactis dat d opposition of pdp are using because of their selfish interest, woo to them, they kill innocent soul just 2 jubadise d innocent president, president goodluck ebele jonathan, if u kan recall what members of apc said in february 2015, google it. 200 members of apc decameped in kaduna because they couldnt withstand d evil plans of d party.. If dere is God jonathan must retain his post as d president of Nigeria. "Nothing can stand in the way of the voices of millions of people calling for change." That's the way Barack Obama put it. No matter how well you rate the Jonathan administration in terms of adherence to Human Right, sponsoring FoI bill, giving 35% representation to women in government, giving more representation to Igbos in government, boosting local rice production, repair of roads, airport and railways to mention but a few of his sundry achievements. It's has always been Goodluck for Jonathan and Badluck for Nigerians! March 28 would judgement day. Dr. Jonathan pls for God sake it is time 4 u to go. Remember deris God oh. You have ruined and destroyed Nigeria completely. Pls pack ur thing including your beloved Patience and live Aso Rock for some one who can rule Nigeria and repair some of your damages. Pls it is not too late, otherwise your friend Gbagbo will recieve you as his guest in Hague. ebele jornathan is a foolish man that can not rule us anymore we want changes in government that why we choose the unbitable person as our right candidate in person of alh. dr. General muhammad buhari as our man. To respond to someone's comment: yes, one can just sit at home and continuously refresh their browser to vote, but honestly, no one has time for that. This is just one of the many platform that Nigerians have chosen to demonstrate their choice for our next president. Buhari may be much older than Johnathan, but he is also wiser, and has the best interest of the country at heart. For this reason, and much more, GMB deserves to be our next president. This is 21st century; let's move forward... it can only get better. Goodluck Ebele Jonathan is our best option for now. The voice of reason says so. I'm amazed dat some people can still be bias and choose to be far from the truth or reality over a matter an ordinary child won't waste time on. How long will you wait for a change (till rapture) ? GEJ is just but a ceremonial weak leader, but gulibly follows the misleading decisions of his self centered companions (cabinet). How come he never took any serious action against BH until now & yet uncountable number of innocent blood has been shed? Doesn't ds bother u?. Well, I believe its time for CHANGE! A leader who is decisive & of reputable character, who feels what an ordinary man on the street feels, is all we pray & aspire for. Rubbish Poll! I can sit down on top my system for 4hours, refresh my browser and give GEJ 4000votes stretch........ Go JEGA! Buhari is an Oldman, if you want to see what it looks like having an oldman rule a digital generation-come to Ebonyi State and you will smell Real Hell in their old man's Administration. This poll is a fradulent poll. Am disappointed in http://thepeoplesdebate.ng. REPENT! @ John, When i read your comment i was extremely surprised " God has already ordained Jonathan. Nigerians are not grateful, I don't know why thay can't see wat GEJ has done fr this country. Up GEJ " . Even a blind people will definitely going to tell you that, nothing has been done by GEJ. Kindly, list 5-10 on what GEJ has done if you can prove it out. If we are to compare few countries to Nigeria especially Dubai, United Arab Emirates (Just to mention few). You wouldnt in anyway mention that GEJ has something in Nigeria but corruption has increased, currency has gone up, economy is nothing to write home apart, Security is zero, unemployment is getting worst, Care not about Education, Health Care has become zero. The worst of it, GEJ cant even differentiate between "Stealing and Corruption". We need to give a chance to CHANGE. God has already ordained Jonathan. Nigerians are not grateful, I don't know why thay can't see wat GEJ has done fr this country. Up GEJ. Go to hell wit ur frudulent pool. Which buhari? Every time God wants to bless Nigeria , opposition always agitates for a change.Tell General Buhari that God Has not ordained him as the president that will bring Nigeria out of her trouble.lets give Goodluck the second chance to move the nation forward. good-day my people,we must be patient while n't handicapt our selve's.the change is in our hand god willing change it,as they postponded election day time goes on,is like the same date.the day is coming pls let's get our weapons (pvc's) ready for the war of positive change,ameen ya allah. Thank God Nigeria now know what it means to vote someone they believed in, not some corrupt women thinking person like Jonathan, know matter the delay, change must come. Goodbye to PDP up APC for change. Its obvious that nigerians needs change, pvcs distribution is hindering some people not to overcome their dream of change, some states are fully prepared, ready, and steadfast, while most states are still left behind, why? Let us all go and get our PVCs and massively vote against the oppression,insecurity ,corruption and injustice in Nigeria. Let us all go and get our PVCs and massively vote for against the oppression(or),insecurity ,corruption and injustice in Nigeria. Let us all go and get our PVCs and massively for against the oppression,insecurity ,corruption and injustice in Nigeria.